Celebrate the birthday of someone special with these inspirational birthday cards from DaySpring! Birthday Greetings 12 Boxed Cards, KJV was published by DAYSPRING CARDS in June 2012 and is our 782nd best seller. The ISBN for Birthday Greetings 12 Boxed Cards, KJV is 081983485275. 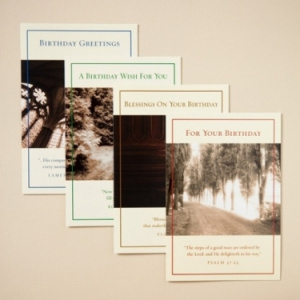 Be the first to review Birthday Greetings 12 Boxed Cards, KJV! Got a question? No problem! Just click here to ask us about Birthday Greetings 12 Boxed Cards, KJV. How many birthday cards are in the box? A:There are 12 cards of 4 designs designs in this boxed set. I've added some more info on the cards to the page. Thank you for using the Q&A Forum.